I'm willing to guess that after reading only the first line of this song, most people began to sing along (mentally, of course) with Frank Sinatra's "New York, New York." Maybe a few even snapped their fingers to the imaginary beat? New York has a way of casting a spell over its inhabitants — and even visitors — thanks to its tall buildings, historic charm, cultural landscape, and capability to make dreams come true. In the Big Apple, anything can happen. But living in such a high-profile spot comes at a price. A recent search on Zillow.com shows real estate in Manhattan ranging in price between $435,000 and $118.5 million. For many of these residences, the cost is all because of "location, location, location." However, others combine a great location with upscale, luxurious features like custom cabinetry, hardwood floors, spacious master bathrooms, and even heated floors. 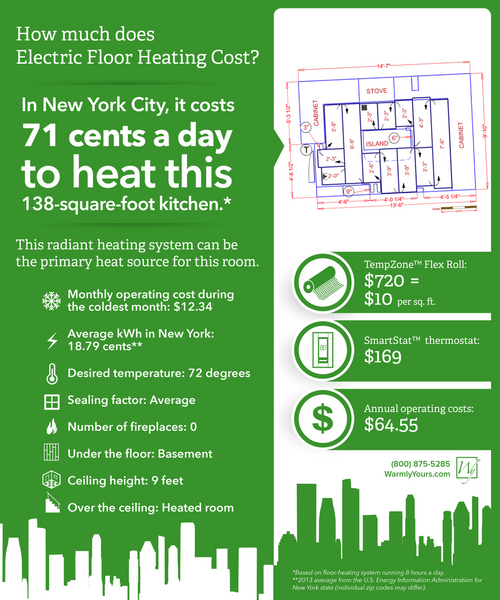 In New York City, floor heating costs between $10 and $12 per sq. ft. for the heating rolls. For a typical kitchen in NYC, an entire underfloor heating system can be purchased for under $1,000. The operating cost for floor warming in New York will be about $0.03 per hour. 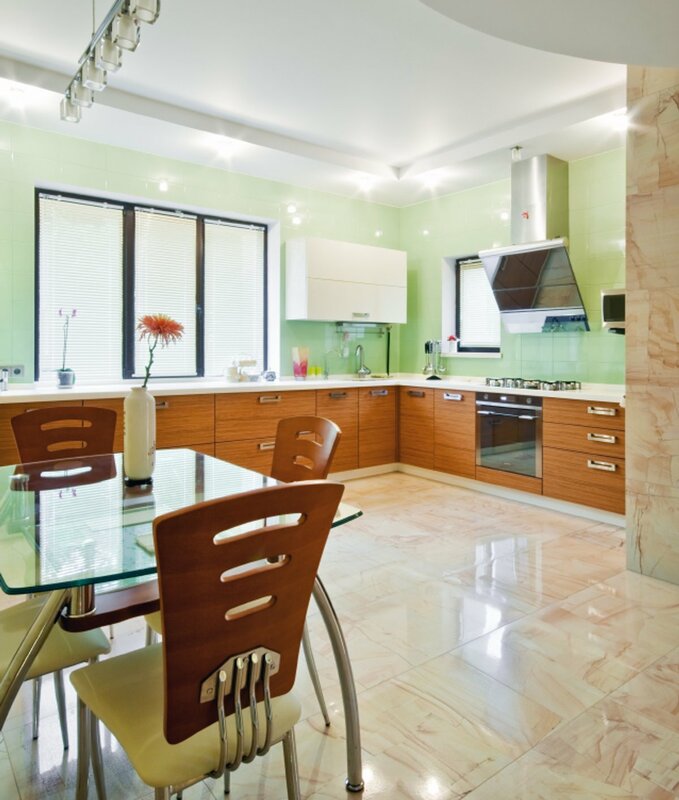 We'll walk you through the pricing by taking a look at a specific kitchen project. In this posh, upscale environment, heated floors have the chance to shine and make the most of a limited space. In this instance (see floor plan below), radiant heated flooring in the kitchen added warmth, comfort and elegance at a reasonable price. This 138-square-foot kitchen used just one TempZone™ Flex Roll to cover more than half of the room — and the price of the floor-heating system was well under $1,000. The roll itself cost $720, and the SmartStat™ thermostat cost $169, bringing the total to $889. That's probably less than the cost of this room's refrigerator! Furthermore, if you break the price out by square foot, the floor-heating roll only costs $10 per square foot! This 1.5- by 48-foot TempZone™ Flex Roll is cut and turned to fit 72 square feet of flooring surrounding an island in the kitchen. As a result, cooking and entertaining in this kitchen will always be a warm, hospitable experience. Plus, the cost to operate the system doesn't mirror the cost of living in New York — thankfully. It costs 71 cents a day to operate this system, according to WarmlyYours' Energy Use Calculator. Plugging the room's specifications into WarmlyYours' Heat Loss Calculator can provide even more estimates about the cost of running this system. This tool notes that the annual operating cost is $64.55, and the monthly operating cost during the coldest month is $12.34. That's all based on the assumption that the system is running 8 hours a day to reach a desired temperature of 72 degrees Fahrenheit. For New Yorkers, this might be one of the most affordable yet luxurious upgrades to their Manhattan homes. Whether you live in New York, Chicago or rural Nebraska, affordable heating is available to you. To get started, check out WarmlyYours' Instant Quote Tool. Within seconds, you'll find out which product you need and how much it would cost for your specific room. To receive a detailed installation plan, we encourage you to send us a floor plan. Our team will get back to you the next business day with a free quote and custom installation plan so that you can see exactly how your floor heating should be installed. Previous Post How Much Does Floor Heating Cost in Seattle?